Finding pieces of history is always fascinating. Holding a photograph of the corner of D Street and Third Street several decades later, one of the many things that comes to mind is the original photographer. 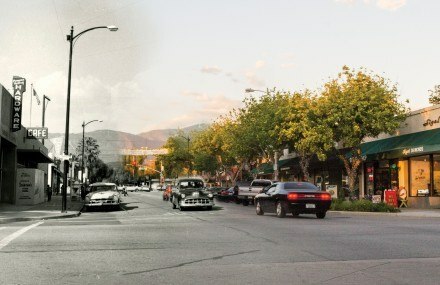 What kind of experiences did they have in La Verne? Photographs are time machines, showing us where we were and where we are now. Though it is not specifically dated, Lemon says the photograph was likely taken in 1956 or 1957 by the cars in the original photograph. The one parked on the left is a 1956 Plymouth Savoy and the 1950 Pontiac Streamliner Station Wagon Deluxe waits to cross the intersection. The facades of buildings on D Street have changed and businesses come and gone, but there are still foundational markers to be found. The mountains are timeless; even some corners and roofs of buildings still match up when you can see them through the trees. The current sidewalks seem to be considerably wider than they were some decades ago. Presently, a corner of drought resistant plants is in the location of part of the crosswalk where the photographer was standing in the older photograph. This photographer preserved a moment of local history. This photograph was pulled out of box P38, filed under one of the many derivatives of La Verne (City), CA – Streets in the University of La Verne archives. Many of these documents are undated, untitled and unattributed to a photographer. Although this anonymous photographer did not align him or herself with more than one thing to make it more obvious where they were standing, it is usually true that when the moment of inspiration strikes, thoughts of making it easier for future d­­ocumentarians to replicate work are not the first thing that comes to mind. It is possibly a happy accident in the crosswalk or a well-planned composition, but the camera is pointed at La Verne’s “L” on the mountains. From this location it can no longer be seen because of obstructive trees and the lack of “L Day” to maintain its shape, but when it snows up there, La Verne residents with good vision and memory can point it out. The reasons for making photographs or writing about the people, places and things of La Verne are to preserve time and record the current conditions of life. These tangible documents will have details much clearer than minds will be able to recall. Though it may seem like it is photographing and reporting the everyday, it is also recording history. That is why, decades later, it is possible to view this Pontiac, affectionately called a “Tin Woody,” passing a modern-day Dodge Charger. Whether this exposure was premeditated or a snap caught in a moment while crossing the street, it tells much about the city and the University of La Verne during that time. Like it is with this mysterious photographer’s case, it is not too crazy to think that the work produced now could be dug out of the archives in 60 or 70 years too.